Spain occupies a large area the Iberian Peninsula, its holdings are the Balearic and Canary Islands, as well as North Africa, located in the city of Ceuta and Melilla, by land area, this European country takes third place after Russia and France. It shares borders with Portugal, Spain, Andorra, Gibraltar and France. From the east and south it is surrounded by the Mediterranean Sea and from north and west by the Atlantic Ocean. The capital city of Spain is Madrid. Spanish climate is very diverse. There are three main climatic zones: Continental - dominant in the inland areas, a moderate sea - in the north and northwest of the country, as well as the Mediterranean - in the south and the Mediterranean coast. The continental climate characterized by cool winters and dry hot summers. Moderate sea - is characterized by moderate temperatures and enough high rainfall throughout the year, and the Mediterranean - mild winters and hot dry summers. Spain isone of the most visited countries in the world. About 40 million tourists are attracted by this country each year. And it is not surprising, because Spain has a lot to be proud - tourists will enjoy the sun, good food, rich heritage of history and culture, the unique nature and the local beauty. If you ever visited this country, there is no doubt want to return again and again, and perhaps move to a permanent place of residence! Spain is attractive to purchase. The real estate market in Spain presents a variety of facilities: comfortable chalet, modern apartments, luxury apartments by the sea, magnificent villas, surrounded by orange orchards. The diverse location of real estate a wide price range and a large number of properties in Spain will meet the requirements of any of the most demanding customer. The cost of the Spanish real estate is much lower than in other European countries. In addition, each year more expensive real estate in Spain, thanks to increased demand for property in this country, so investment in property in Spain are quite profitable. Also you can rent your villa or apartments to tourists, while receiving additional income. The process of buying apartments, chalets or villas in Spain is quite simple, tax rates on real estate purchase and the cost of its contents are quite low, and the possibility of buying property in mortgages - all these factors make the country attractive to buy property in Spain. Today, profitable and prestigious to have a property in Spain! If you decide to buy property in Spain, our overseas real estate agency will help you choose a villa, apartment or apartments in Spain. Once you select a property, we will arrange for you to check this property in Spain. Our specialists will assist you in processing sales transaction. 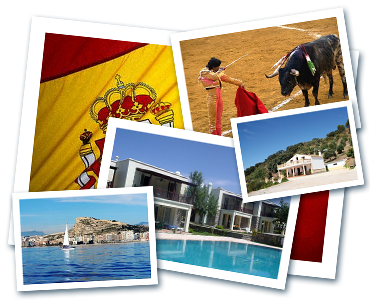 We take care of everything you need to buy your apartment or villa, as you enjoy a holiday in Spain. In our agency you can also rent a chalet, apartment or villa in Spain, so you can enjoy a wonderful holiday in this wonderful country, not depending on any rules and hotels will have a rest "at home"! In addition to residential real estate in our database of overseas property in Spain there is commercial real estate. We can offer you acquire businesses or pick up for you a commercial area in Spain for further equipment. In our agency You can either buy or lease commercial real estate in Spain. Our task is to make your dreams of purchasing foreign real estate in Europe to fruition! Space By keyword The online database is not full. For example "penthouse", "ocean view"